I have a lot of feelings about magnets. Let’s get that out in the open first thing. I’m not being ironic here. I believe souvenir items are a genuinely wonderful phenomenon, and magnets are their apex form. People spend a lot of time choosing souvenirs. We idle in front of the postcard rack long past our parking meter expiration. Buses are missed; tour groups abandoned. Entire families weigh in on the perfect choice and often end up picking separately to reach satisfaction. The perusing of the souvenir shelves often reflects the amount of time spent in front of the artworks themselves, and for very good reason. As to why we buy souvenir magnets in particular, I’ve got a theory. Souvenir magnets almost always go on the fridge, right? The one place we’re all guaranteed to visit multiple times a day. The stuff we keep on the fridge, therefore, is all the important day-to-day stuff. Bills, shopping lists, love notes, reminder notices, calendars, the kids’ latest artwork – all the significant items of the Now, arranged in the centre of our daily routine. And what is it that we use to hold the Now in place? Our souvenir magnets. Like memory anchors, these are our micro-monuments of the Then. 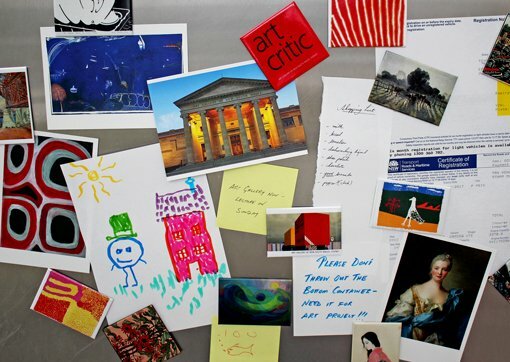 On the fridge, all the essentials of our everyday are held up by the moments that we were transformed. We keep our present tethered with our past, and if that’s not a marvellous thing to be having feelings over I don’t know what is. Now if you’ll excuse me, I think I’m late for the train. Footnote: The sales of all souvenirs from the Gallery Shop directly contribute to the Gallery and its collection, which is also pretty magnificent.